Dubai Police has long been the proponent of prevention rather than cure. 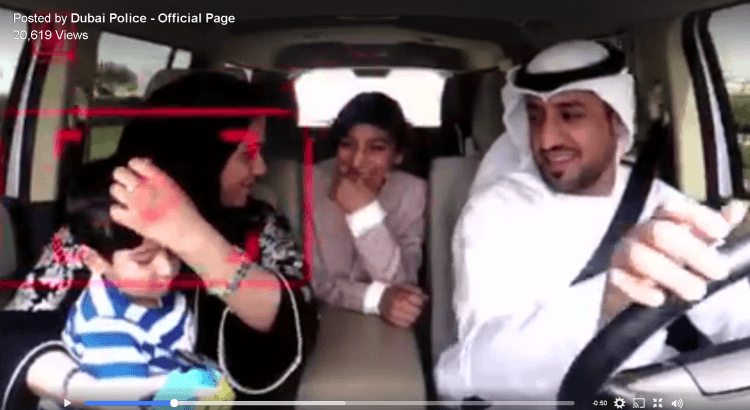 The video below, posted on their Facebook page, shows how a family in the UAE can amass AED4200 worth of fines in a matter of minutes. They don’t want our money, they want to stop bad driving habits. If you are new to the country and have never seen a toddler in the front seat of a car, this video may be a surprise to you. Most of us are well aware that it is very dangerous. But, there are some (yes, a minority, but also many) drivers in the UAE who sit children on their laps. In this case the child is with the passenger but it is equally common to see a child on the lap of the driver. We’re not sure if the red camera effect represents actual technology in Dubai’s police vehicles, but for a force with a dozen super-cars and robots in malls to answer questions, anything’s possible. Well done Dubai Police for forcing these fines. Well done for continually campaigning to keep us safe on the roads. And thank you for your continued hard work whether the sun is up or down, rain or shine.